The plastic part of the eartags are based on the animal eartags that are made by Safetag Animal Identification Systems in South Africa. The tag size is F4 and is available in red /blue /orange /purple /yellow /white/ green or pink. Safetag provide the multitag applicator and all weather marking pens for adding visual identification systems to the tag. The user can also get their stock identification numbers and logo laser etched into the tags for long life. Laser marking requires the identification number to be added after moulding at the Safetag factory. Thereafter the eartags need to be sent to Trolley Scan to have the passive transponders fitted. 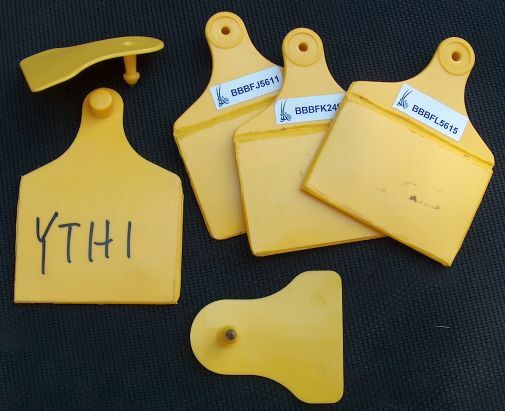 The eartags are made from polyurethane and have a very long operational life. The transponder inside each eartag has been specifically designed to give long range when encased. The transponder is NOT compatible with any other readers on the market and CANNOT be read by readers that were not developed by Trolley Scan. The eartags are tested at 10 metre operational distance in front of a fixed RFID reader in manufacture. The eartag weighs 26 grammes. (21 gm for the female part and 5gm for the male part -which includes the metal insert). Width of tag 76mm . Total height of tag= 10cms; height of display area for label = 5.5cms The tags might be too heavy and too big for smaller animals like sheep and goats. Technology Passive RFID transponder with 100 year life encased in polyurathane eartag.